If you’re looking for a fun educational game for your little one, look no further. The Alphabet Jigsaw is a fantastic app that utilizes a play-based learning style. Geared towards pre-school age children, this is a great way for them to learn and practice all of the letters of the alphabet. In this app, each letter is a jigsaw puzzle. The outline of the letter is provided, and your child drags the provided pieces into their appropriate places within the outline. There are two levels – easy and more challenging. 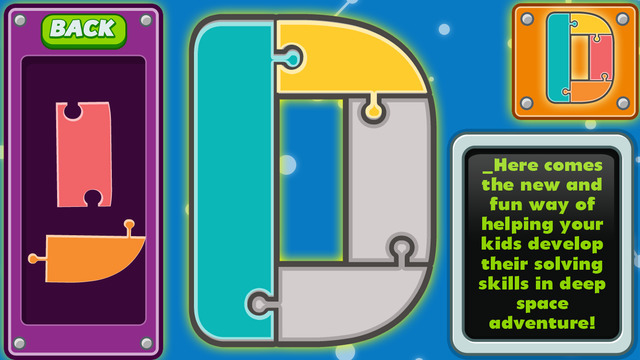 The easy level features the shape of each puzzle piece within the letter. Your child can simply look at the pieces provided, which have the familiar knobs and notches found in most puzzles, and match them up to their corresponding spaces. The more challenging level provides the same letter outlines, but the puzzle pieces are geometric shapes and there are no shape outlines within the puzzles. Children will have to use a little more spatial reasoning in order to get all of the pieces to fit together. Both levels provide a visual of the finished puzzle on the same screen, so that children can reference it and use it as a guide if necessary. Jigsaw puzzles are fantastic educational tools for children. As they figure out how the pieces fit together, they are also working on hand-eye coordination, trial-and-error processes, and spatial awareness, among other skills. In addition, these puzzles provide a great opportunity for parents to educate toddlers on the alphabet and letter recognition. This Alphabet Jigsaw can also be a very useful tool for children with autism. They can practice their fine motor skills, spatial awareness, and visual processing. Take the opportunity to not only help them learn and distinguish between individual letters, but also different shapes and how they correlate to one another. Definitely don’t miss out on this app! Make education fun for your tots and toddlers with Alphabet Jigsaw!